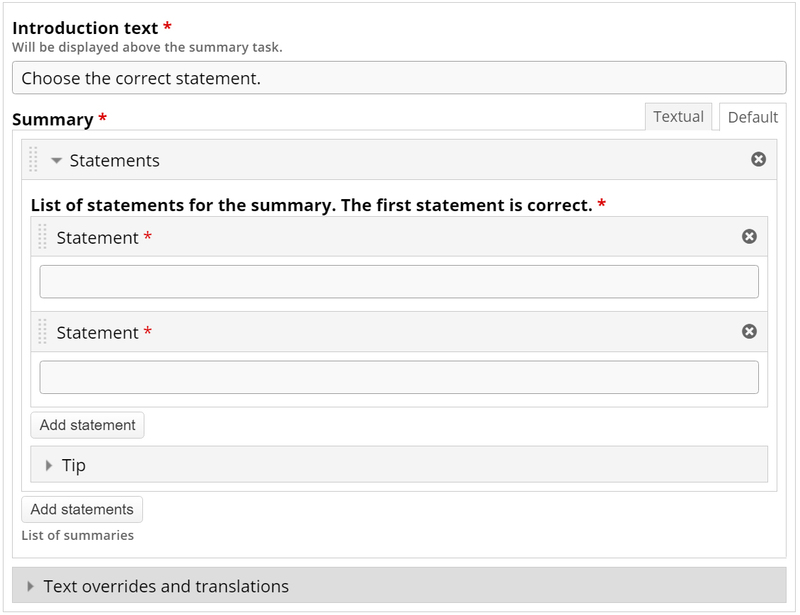 The Summary content type allows learners to interactively build a summary of a certain topic. Summaries are a perfect way to strengthen your learners’ ability to remember by encouraging them to build interactive summaries as they learn. Summaries work best when they are presented to the learner immediately after the learning content. Summaries help the learner remember key information in a text, video or presentation, by actively buliding a summary about the topic at hand. When the learner has completed a summary, a complete list of key statements about the topic is the end result. Summaries can be created stand-alone or they can be included in Interactive Videos or Presentations. Either way, they are created in the same way. Navigate to the menu that enables you to create new content. In Drupal, you select Interactive content. In WordPress you press Add new under H5P Content in the admin menu. In WordPress you select H5P Content and Add new from the admin menu. Select the Create option for H5P. If you find Summary in the list of Content types, skip to Step 1. You will now find Summary in the Content type list when creating a new H5P. An edible round berry, belonging to the cowberry group (Vaccinium sect. Cyanococcus), with flared crowns at the end, that turns blue on ripening. Head over to where you usually create new content on your platform. In Drupal you go to Create content and select Interactive content. In Joomla you create an article and press the H5P option below the article. Then select the Create option for H5P and choose Summary from the list of Content types. In this tutorial, we will focus on creating the actual Summary content, which happens in the top part of the Summary editor. The lower part of the editor, below the label Common fields, deals with translations and default text and is not important in this context. The Introduction text will be visible to the learner throughout the Summary. You can use this field to give the learner a short introduction or some instructions. A default Introduction text which works fine in most cases, is suggested. However, you may modify or translate it into another language. The Summary content type consists of a sequence of statement groups. By default, the first statement group consists of two blank text fields each labeled Statement. You need one correct statement and at least one incorrect statement in each statement group for the Summary to make any sense. Note that the top statement in any statement group should always be the correct one. Blueberries are edible, round berries. This will be the correct statement. Blueberries are non-edible, elongated berries. This is, of course, an incorrect statement. Blueberries are non-edible, round berries. We have now finished our first statement group! However, only one statement group makes a very short summary of the topic. You would usually like to add two or more statement groups. Press the button Add statements. This will add a second group of statements. Blueberries turn green on ripening. As the blueberry experrts we are, we know this is a wrong statement. Blueberries turn blue on ripening. This is the correct statement. button in the top left corner of the statement group, drag it to the top of the List of statements, and drop it there. Now the correct statement is at the top of statement group, as it should be. button in the top left corner of the statement group instead. Repeat step 6 until you have added enough correct statements to summarize the topic well. You state "Summaries help the learner remember key information in a text, video or presentation, by actively buliding a summary about the topic at hand." This is not a fully accurate claim based on the nature of the Summary building process in this H5P library. There is a risk that selecting incorrect choices will unintentionaly reinforce the wrong information. This method of summarizing is also a poor predictor of retention in a future assessment or application. If the goal of an instructional activity is to demonstrate comprehension of subject matter, it would be better to direct learners to write or record their own summaries (from scratch) based on notes they have taken while engaged with an activity or media. This is a really good point. I too feel that H5P summary is a bit lacking in the sense that it does not force students into creatively coming up with their own summaries based on their own understanding. In the Opigno quiz module, very short answer questions are an option for the student to write down their answer for automatic comaprison and checking against a model answer. Definitions that require exact wording are an obvious candidate for this, however, perhaps the use of hot/key words and phrases might make it more flexible enough to more open short questions and answers. Obtaining the exact wording could be facilitated by providing a scavenging capability for seeking and finding the correct answers word for word and then typing or copy-pasting them into the answer box. In this way there is no guess work and the students have no excuse to get the answers wrong except for their own laziness. the posting sharing and discussion of their ideas via an associated bulletin / Bill Board for peer (p2p) review is another fallback option. If the peers accept the answer given, perhaps using a simple yes or no voting system, the result could be fed back into the learning records store. These and more advanced version of the ideas are something I have been toying with and would very much like to see actualised. I like this rather than a dull radio button, is this avaialable in the question-set? Unfortunately Summary is not currently available in Question Set. It may be added in the future. cheers Tim for the update. as there is a generational change in our course demographic, the days of the radio button check-box and next button are dead. Though the idea of providing a summary / follow-up exercise on the key points is a good idea, technically it seems to me to be no different to a a single or multi multiple choice question set. If only the wording of the questions and answers changes, what is a separate content type / module needed for / do that the other CT modules don't? Hi Chris, I'm not sure I understand your question. As I understand it, the summary is a set of statements for the student to choose from to verify their memory or understanding of what they have read. 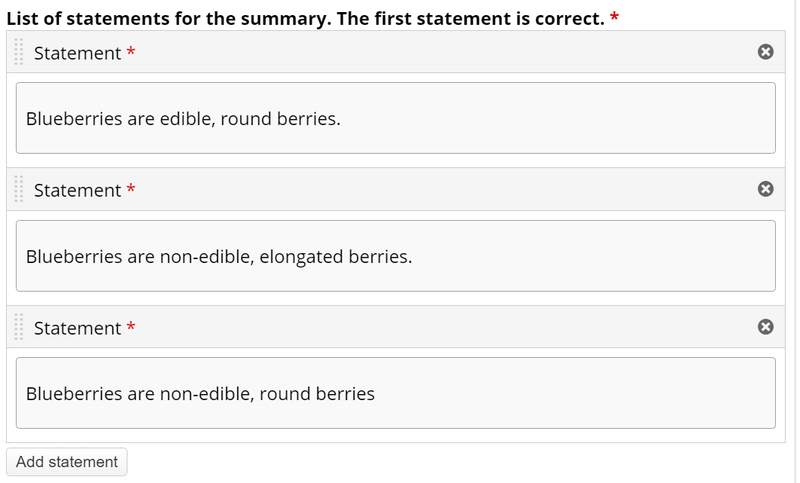 I do not understand how this differs from any other multiple choice single or multi -selection question, except in name. Therefore, Could you please explain what the difference is between the Summary and Multiple Choice Question tools? What does this summary tool give or do differently that adds-value? In my opinion the summary gives you what it is designed for a summary of the lesson in a question form. Yes it is similar to the other content types but it is more compact which gives the learner the finer points of a certain lesson. I like the summary content type however is it possible to remove the requirement to have right and wrong answers? 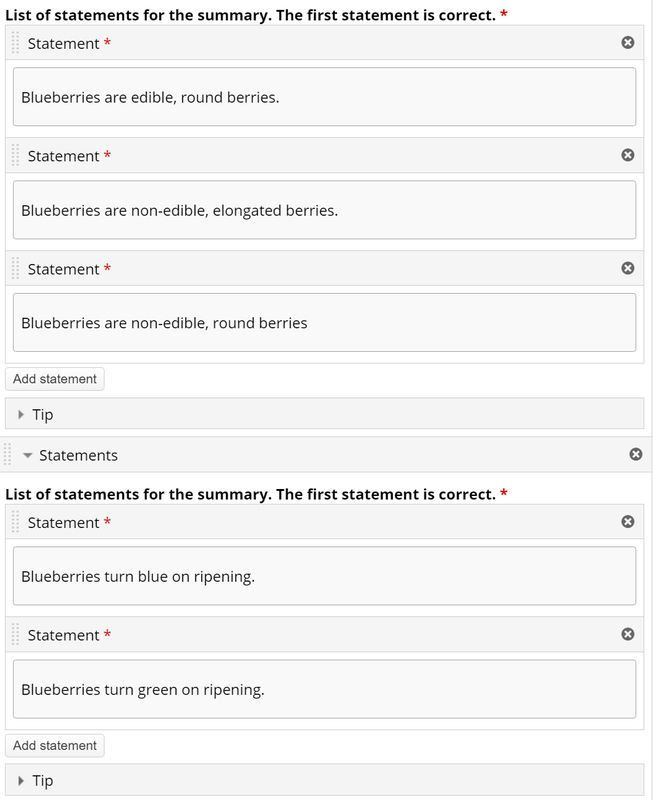 I would like users to be able to select their best statements from a list and access a summary of that list at the end. As it stands, users get instant feedback about their answers and are expected to only select the right answers... Thank you. This is a good suggestion and I would suggest that you head over to the Feature Request page for better visibility. I was wondering if there is a way to remove the summary option from an interactive video, I don't really need it. Currently this is not possible but please head over to the Feature Request forum to post your suggestion/request. I'm afraid this is not possible not unless you make changes to the code. I don't think it is possible to add audio to the statements. I would be a great addition I think so that students could see how paraphrasing and recap is done. Any idea if this is going to be implementable ? More generally adding audio as a possible answer to Multiple and single choice questions would be really nice. Is it being talked about?